The United States Mint today ended the sale of 2009 American Gold Buffalo Bullion Coins, telling customers in a memo that its inventory has been depleted and that no more of the 2009-dated coins would be produced. "The United States Mint has depleted its inventory of 2009 American Buffalo One Ounce Gold Bullion Coins," the US Mint stated in a memorandum to authorized purchasers of the precious metal coins. "No additional inventory will be made available. As additional information becomes available regarding 2010-dated American Buffalo One Once Gold Bullion Coins, you will be notified." *As reported by the US Mint on Dec. 4, 2009. With new record gold prices and the recent Mint suspension of the one ounce bullion 2009 American Gold Eagle Coins due to a depleted inventory, demand for US Mint bullion coins has risen even higher. Fractional 2009 Gold Eagles launched Thursday to a record selling pace, with one day sales that approached totals from all of 2008. In a separate memo today, the US Mint also told authorized dealers that "the American Eagle Gold Tenth-Ounce Coin inventory was depleted" and that "inventory for the half-ounce and quarter-ounce coins remains very limited." Following the sale of these remaining gold coins on Friday, the Mint anticipated that it would again offer all fractional sizes by mid-December, but in an allocation process. The resumption of American Silver Eagle bullion sales will resume on Monday. These silver coins were suspended along with the one ounce gold coins last week due to depletion. The US Mint sells bullion gold coins for a small amount over the current spot price of gold, but only to authorized purchasers. The authorized purchasers in turn resell the coins to coin dealers, precious metal providers and/or directly to the public. The obverse has a portrait of a Native American, said to be a composite of three Indian chiefs. Many have claimed to be one of those three models, but only two were ever verified by the artist James Earle Fraser; Cheyenne Chief Two Moons and Lakota Sioux Chief Iron Tail. The reverse contains an image of an American buffalo, also known as a bison. It is believed by many to be modeled after the creature named “Black Diamond” who lived in the New York City Zoo. 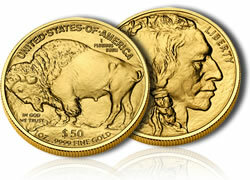 The US Mint also offers a numismatic or collector 2009 Buffalo Gold Proof Coin.